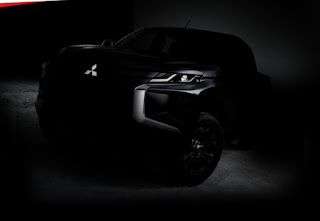 Home » 2018 » 2019 » Auto » Car » Facelift » Mitshubishi Triton » Mitsubishi Triton Facelift » New Car » Pajero » Pajero Sport » Triton » Mitsubishi Triton Facelift Teaser Spread, Face the Pajero Sport! From the picture above shows that the Mitsubishi Triton Facelift will rely on a new face that has applied the latest design language from Mitsubishi, namely the dynamic shield. And since the Mitsubishi Triton is the basis of the production of the Mitsubishi Pajero Sport, it is not too shocking if the proportions and face shape of the Mitsubishi Triton Facelift become more similar to the Mitsubishi Pajero Sport. The similarity between the two also makes Mitsubishi need not be too difficult to share components such as headlights or bumpers and grille. Even so with its development, it does not require too much time and money if compared to remaking the face of a Mitsubishi Triton Facelift that is different from its siblings. Then what is it like? Let's discuss it. As usual, we will try to send this teaser into the photos and explain a few points. This effort turned out to reveal a new fact, where it turned out that the bumper and face of the Mitsubishi Triton Facelift was not entirely similar to that of his brother who was a ladder frame SUV. If observed, indeed the headlights of the Mitsubishi Triton Facelift are the same as the Mitsubishi Pajero Sport that we already know, but there are different details in this section, where the LED DRL looks different in shape from the Pajero Sport version. Even so with the front grille that looks using two overlapping blades. The chrome accent in the dynamic shield indentation also looks a little different, and most importantly it is on the front bumper. Yep, the front bumper looks to accommodate a lamp or maybe two large pieces and like the one owned by Mitsubishi Xpander. This part could be the position of the fog lights or turn signal lights, but of course we still can't speak further because the pictures on the teaser are still very unclear. Another detail that is seen is the use of 6 crossbar wheels that look sturdy. What else? Some of the other details that we captured were only about the shape of the hood which was similar to the Mitsubishi Pajero Sport, the antenna that used the short pole model, and the fender shape pull which was very similar to the Mitsubishi Pajero Sport. Overall, the design of the Mitsubishi Triton Facelift is indeed arguably very Pajero Sport, but with a few other details we get to show that there are ‘nuances’ in the style of Mitsubishi Xpander that were also taken to this Mitsubishi Triton Facelift. We are also a bit cheery - if only the latest Mitsubishi Delica D: 5 will carry the same combination as in this Mitsubishi Triton Facelift or even the Pajero Sport will also face like this? Well, so what do you think of this Mitsubishi Triton Facelift? It seems that this car will launch in November 2018, because Mitsubishi itself has a special agenda in Thailand that month. Let's convey your opinion. 0 Response to "Mitsubishi Triton Facelift Teaser Spread, Face the Pajero Sport!"